"A Naval Brigantine in a Calm Sea," John Clevely, 1752, National Maritime Museum. 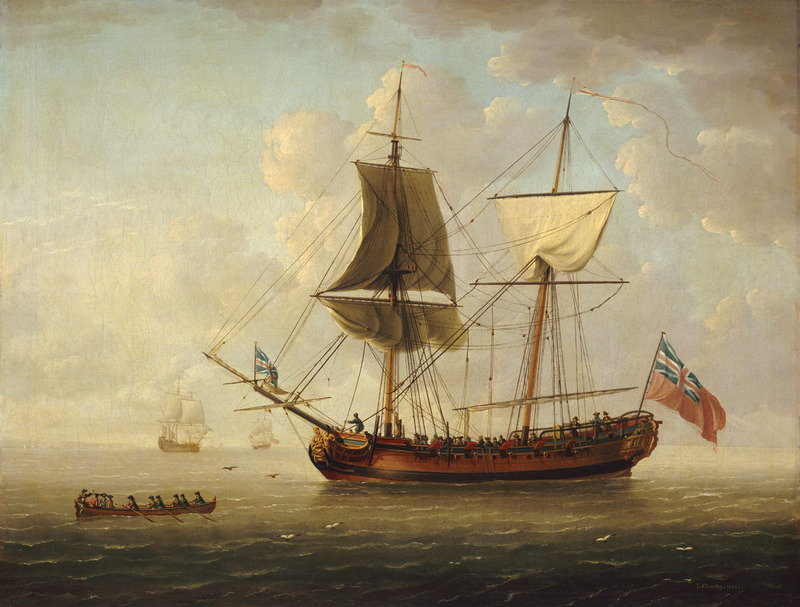 In the eighteenth century, the terms "brig" and "brigantine" were almost interchangeable. Port of entry records in the American colonies sometimes show the same vessel as one when arriving and the other when departing. This was likely the result of lazy accounting (many of these same records are hastily written and leave out vital information that should have been reported) rather than a rerigging of the vessel. To the uninitiated, a brigantine differs from a brig in that she has a gaff rigged mainsail, while the brig is fully square rigged. The brigantine in this painting sports a lateen rigged sail that is furled across the mainmast. Three gentlemen are being rowed out to the brigantine by a trim barge crew. The crew mostly wear round hats with narrow brims and round crowns, though the man in the bow may be wearing a jockey style barge cap. They wear white shirts with brown or blue jackets. The coxswain wears a brown jacket and jockey style cap. Our brigantine's crew are similarly attired in a mix of blue and brown jackets with round hats and caps. Scatted throughout are a few in cocked hats as well. Resting on the larboard rail of the quarterdeck are two men who appear to be officers, conversing by the swivels.